If you have never given meditation a chance, then today is your lucky day! Here is a great technique that you can start practicing first thing before bed tonight – it is a short but potent mantra called ‘hamsa‘ and originates from the ancient practice of Kriya Yoga. Ham and Sa (pronounced hum sah) are the natural sounds that your mind produces when you breathe in, and breathe out. Breathing in sounds Ham, while breathing out sounds Sa. Sit on a folded blanket on the floor in a comfortable position, ideally in half lotus or full lotus position (padmasana), and close your eyes. Sit with your spine erect (not too stiff, not too slack – this is very important), and with closed eyes focus on the point above your just above and in between both your eyes. Now allow your breathing to follow its own natural rhythm; don’t try to force anything. Simply acknowledge and accept short breaths as short breaths and long breaths as long breaths, nothing more. Even though we breathe all the time automatically, even when we sleep, we rarely allow our minds to be aware of this. At first, closing your eyes to concentrate on breathing might feel like a forced effort, but it will soon feel very natural and will develop it’s own rhythm, much like your heartbeat. After a few deep breaths, deeply inhale and sound Ham (hum) in your mind, hold the breath and then exhale while sounding Sa. As you inhale, expand your stomach to allow the air to fill your belly, when you exhale, tighten your stomach very gently to push the air out. Doing this while mentally repeating the mantra will sharpen your concentration and ward off any distracting thoughts. It is also helpful to think, at least initially, the meaning of hamsa which is ‘I am that’. Meditate on the interconnectedness of everything, and how the universe is contained within you. If you like, you can use your hands to create and hold a mudra. Mudra’s are essentially yoga for the hands and they are used to further enhance the effects of meditation – that is they allow prana (energy) to flow throughout the body. There are two main mudras for meditation that you can adopt. The Buddhist dhyana mudra: We place our hands in our lap, one hand on top of the other (whichever order feels most comfortable, usually right goes under left) and the two thumbs touch each other to form a slight pyramid shape pointing up towards your chin. Therefore your hands are imitating your body’s pyramid shape when we sit in meditation. We use this to gauge our level of concentration; when we are in a high state of concentration the pyramid maintained by the thumbs remains erect and strong, when we lose concentration the thumbs begin to drop – the Buddha is often depicted as meditating with this mudra. The Yogic (Hindu) chin mudra: We rest each hand on their respective thigh, with all of the fingers extended outwards except for the thumb and index fingers, which touch to form an O. Again, the fingers should be relaxed, but not too slack; the straightness of the fingers is an indication of our levels of concentration. Arms should be straight and you should push your chest forward, this will straighten your spine and create a pyramid shape for your entire body (pyramids are a symbol of strength, and the shape gives your body a strong foundation). The arms shouldn’t be too straight, allow a slight bend in the elbow. 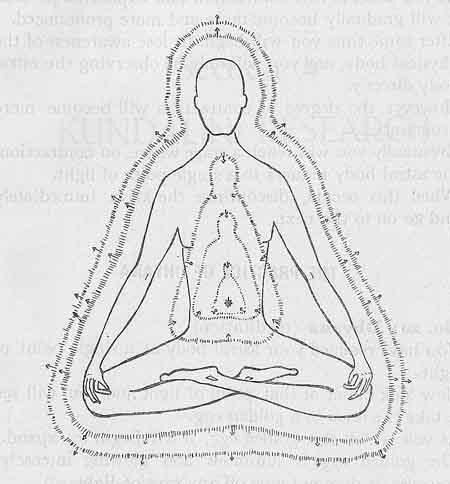 Yogic tradition states that the thumb represents the supreme, while the index finger represents the individual; therefore, the two fingers joining to form an O represents the fusion of individual consciousness and cosmic/collective consciousness – the Hindu God Shiva is often depicted as meditating with this mudra, while Christ is depicted holding this mudra close to his heart. Do this for thirty minutes once a day possible, work your way up to an hour if you feel you can do it. If you can’t find time to meditate for that long then at least try to squeeze in 20 minutes. The best times to meditate are either first thing in the morning, or the last thing at night. It is important that you try to incorporate it into a daily practice, as you will not taste of any fruits unless you constantly tend to your inner garden. In keeping with this analogy, think of meditation as sunlight, and mantra such as hamsa, a method for focusing that sunlight. The more focused and one-pointed your concentration is (the less distracting thoughts you have) the more powerful a beam of sunlight you can direct on your inner garden. In time, and with daily practice, peacefulness will grow where the soil used to be bare. Just as the sun rises and sets every day, so should you aim to meditate once every day during either of these times. Become the sun, and your life will light up. The initial stages of meditation are all about concentrating on the breath; only through concentration of the breath can we get rid of the cobweb of thoughts that are in our head space at all times. We have become so accustomed to living in a constant hyper state of thinking that we don’t even realise it until we actually sit down to meditate. You try to stop thinking, and more thoughts invade. Soon enough you start feeling itchy and have to scratch those itches, as though the body is resorting to drastic measures to get you back on the thought train. This is all good stuff, it is progress in the right direction and is something we have to work through to achieve deep and effortless states in meditation. After a few sessions, your thoughts will calm down faster, and you will realise how much power you unnecessarily allow them. When the Buddha was seated under the Bodhi tree where he attained enlightenment, the demon Mara attempted to seduce him with material desires, such as beautiful women, but the Buddha remained unphased. So the demon summoned an army who threw all sorts of arrows and spears at him, the Buddha simply touched the earth with his right hand and all of the spears and arrows fell and Mara vanished. From a psychological perspective, these arrows represent thoughts or desires that attempt to take us out of meditation, eg by making us feel hungry, or itchy, whatever it is. By dismissing their power, they can no longer penetrate us and cause suffering – they simply fall to the floor. Thoughts are like a spoilt child who has grown up getting everything he wants, and you are either the parent who believes he should get anything he wants, or the parent who thinks it’s too late to do anything about it. Through meditation you can regain your deserved power over your thoughts, and it all starts with the breath. In the following passage from Bhagavan Das’ book ‘It’s Here Now (Are You? ), Bhagavan Das describes his learning of the Ham Sa mantra in his first few weeks living in India. This entry was posted in meditation/yoga and tagged ham sa, kriya yoga, mantra, meditation by Michael Cunningham. Bookmark the permalink. Hamsa also has a metaphysical meaning- a pheonix out of time and space- meaning transcendence-thanks for posting. Thanks for your comment, I didn’t know that! Also, props on having that mandala as a picture; I’m pretty sure one of Carl Jung’s patients drew it. Hi. The original scripture says, Ham= exhale, Sah = inhale sound. If that were true then the mantra would be called Sah-Ham, considering we inhale before we exhale.